Since spending some money on new figurines, I decided that I should finish off those that have been sitting there half complete for a couple of years. Firstly I will cover my painting of the first two Scale75 figures. I have already covered the painting of the Coldstream Guardsman and now I will discuss the painting of the Brunswick hussar. This figure had to be painted almost entirely in black so I purchased a box of Scale75 black-and-white paint set which gave me the various shades that I needed. My friend Mark showed me how to paint very fine lines so I pulled out the trusty paint brushes that he purchase for me and off I went. As an experiment I purchased a Trumpeter turntable. I made some videos of my figurines turning on the turntable to put them in as good a light as I could. I also downloaded some royalty free music to go along with the video. First off then is the Brunswick Hussar. This is a figure of a soldier that fought at the Battle of Waterloo and went very nicely with my Coldstream Guardsman. Having finished this off, I purchased a 90 mm Metal figure from Alexandros Models in Greece. This is of a Japanese troll called One-Ni- Kanabo. It is sometime since I have made a metal figurine and it was obvious that this was going to take some effort to hold whilst painting and also in putting together. I drilled holes in each of the major parts and superglued brass wire into them so that I had something to hold on to whilst painting. As with all my figurines nowadays I gave it a coat of Tamiya white primer which gives a very good base for all my acrylic paints. I had to get some advice from the Internet as there are no instructions, as usual, with this figurine so you're left pretty much to yourself. It seems that these trolls always have red colour skin. Fortunately I already had a pack of Andrea red paintsso I had all the shades of red needed to give definition to the skin. The next thing I worked on was a native American chief. Unfortunately I have lost the box for this item so I had no idea on the manufacturer and have no idea on be original figure. This meant that I had to make up the colours to be used. I did make it simpler by painting his chest cover,which I presume was made from beads, in a single colour rather than separate coloured lines. I'm not very happy with this figure as the face has been moulded with very deep features and also looks very like Captain Peacock from "Are you being served." This disturbs me - grin. Anyway I continued with it and finished it so it is another one that I can put on the shelf and forget about. This has been on the go for a few weeks. There have been times when I felt like throwing it but I have recovered it into something that is almost worth looking at! 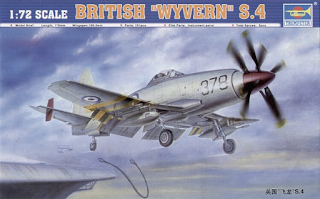 The Wyvern is a strange beast - a propellor driven aircraft in the 1950s - so, clearly in jet territory. It first flew in 1946 but took until 1953 to go into service and was only to last until 1958 on active duty. It did take part in Operation Musketeer - the Suez Crisis in 1956. 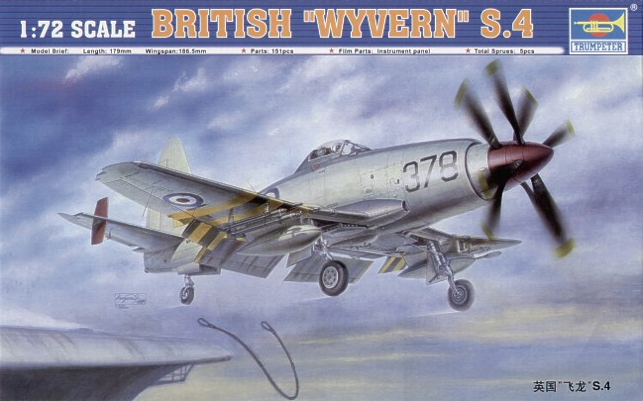 One set of markings in the kit is for one of these but I didn't fancy the yellow and black operational markings - I have a bit of an aversion to D-Day stripes or their ilk. I chose WL879 of 813 squadron, HMS Eagle in 1958. As I had a friend that served in Fairey Gannets on Eagle, I always have a soft spot for that ship. OK, down to the kit. I thought that I would make it with the wings folded - an in-kit option - however, the hinges went rogue on me and broke at a crucial time, so I had to go back to a spread wing version. The outer wing parts didn't have any attachment points to the main wing. I ended up having to use superglue to stick it all together. I then had a terrible job of cleaning up the aforesaid superglue. I was not happy with the finish left on the wings but there is a decal that goes on over the join so it all ended up OK.
Painting was a bit fun. I used paints from my Vallejo Coastal Command/FAA set, namely Extra Dark Sea Grey and Sky TypeS. I kept finding out that I had painted the wrong aircraft - the propellor boss is a different colour along with the winglets on the tailplanes. Eventually, I went back to Google and found that the actual aircraft seems to differ from that shown so I followed the images on the web. After fitting the undercarriage I gave it a coat of Xtracrylix matt varnish. Finally, I fitted the cockpit canopy and the navigation/formation lights. Overall, it wasn't a bad kit but it could have been better. The instructions had some errors - I particularly liked "floding wing' in a few places, but I bet their English is better than my Chinese! I was worried that I would be unhappy when finished but, actually, it's not bad. I wouldn't take it to any club (if I went to any ever again!) but it will be OK in my shelf collection of Fleet Air Arm aircraft. Yet again, the photos have been taken on my iPhone 6s and run through Helicon Focus. I have a nice little tripod for my phone now which came with a bluetooth remote release. This means that I can touch the screen where I want the focus; let the camera steady; fire the shutter. I take 6 images that come to gather for a single shot. This ensures that all parts of the image are in focus.